First,which types of products used in (such as luggage, footwear, ski clothing, raincoats, tents, need or acid washing jeans leather larger classes) or other special requirements. Second, the composition of the fastener requirements, the need azo (AZO), does not contain nickel, or pass the needle detector test. 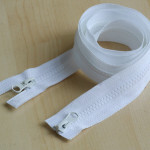 Three, 3 #, 4 #, 5 #, these are the sizes of zippers, which is masured by the the amount of the closed based width. The larger the number, the thicker the zippers. 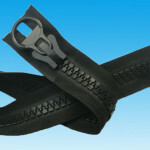 We usually use 5 # zippers for jackets, 8 # and 10 # zippers are considered as special size zippers. 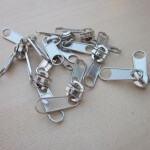 The vast majority of brand clothes will use their custom-made clothes zippers, which are usually in different styles, but above all engraved with the brand LOGO. This is the details of things, but do good to become a symbol.